Oil & Gas Representation – Attorney Doug Clark focuses his legal practice on representing Landowners and Oil, Gas and Mineral Rights owners in Pennsylvania. Doug has represented hundreds upon hundreds of Landowners in numerous oil and gas related issues and these numbers continues to grow. We believe that providing education to the PA landowner is the key for the landowner to make the best informed decisions when leasing their property to maximize both the property protections and financial gains. Remember, The Clark Law Firm, PC has never represented a natural gas or pipeline companies and never will. Attorney Doug Clark is committed to evening the playing field for Pennsylvania Landowners and providing highest quality legal services to his clients. If you are presented with any oil and gas related legal issue, contact The Clark Law Firm, PC. Doug Clark is Pennsylvania’s Landowner Lawyer and he will help you with all your oil and gas legal needs. If you need of an oil and gas attorney, Contact us today! My wife and I would like to thank the Clark Law Firm for their work on what was to be a simple water line ROW, but became more complex as the natural gas company went from this proposal to adding an electric ROW, and directional drilling pad. 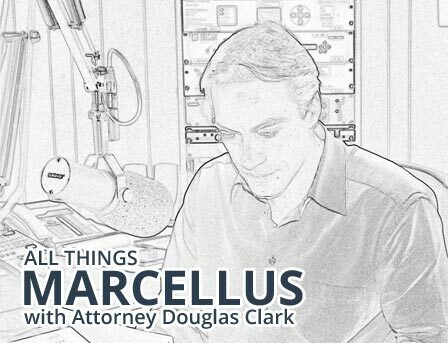 Attorney Doug Clark is very knowledgeable. He answered our questions, guided us through our decisions and supported our final decisions. He negotiated with the natural gas company on our behalf until the final agreements were signed. His staff made us feel welcome and at ease with asking any questions we might have had during this process. They understood our concerns as property owners. We would definitely recommend the Clark Law Firm to anyone seeking legal council to deal with the natural gas companies.